It finally happened in August. Talleys pulled the plug on the mediation that began after they failed to meaningfully participate in the collective agreement negotiations with the meat workers at their AFFCO plants. This 'negotiation' should now be in binding arbitration, the first negotiation to do so since the new employment laws came into effect in early March this year. So here are some facts about how this has come about. This is the first contract negotiation to go to arbitration after new Employment laws came into action in March. Not surprising since the AFFCO meat worker contracts expired in December 2013 and Talleys refused to negotiate meaningfully during 2014, so each worker went onto individual contracts (which were the same as the previous collective contract) in December 2014. Since the first Monday in March, any new worker was signed up to a different individual contract to existing workers, meaning they would likely to be not getting the same pay and conditions. This may mean they get considerably less than some of their colleagues. This led to the Meat Workers Union setting up the campaign Jobs that Count which they launched in March. As the CTU Rep for my NZEI Area Council I had the opportunity to attend the Waikato launch in Ngaruawahia and blogged about it in Why the Meat Workers deserve your attention right now. There we heard about the details I have discussed in the previous paragraph above. workers are not allowed to meet in a union type way on site during work hours or off site outside of work hours. WTF? That is so illegal denying workers the right to join the union! workers will have their employment terminated if they put the company's name in disrepute - so blowing the whistle on the company to the union, an MP or Work Safe (aka the old Labour Ministry) will cost you your job. Apparently even hosting a union meeting will get you fired. the company will not deduct and/or forward worker's union fees onto the unions. That is their right, but it is spiteful none the less and speaks to their desire to crush the union. workers have to allow the company access to their health and ACC records. WTF again! Wrong wrong wrong on so many levels! They can't access your records without your permission. You are obliged to notify the company of health or injury issues that affect your ability to work, but that's it. workers currently get two 15 minute breaks a day. Due to hygiene restraints, by the time they get their "on the chain" gear off they often only have 2-5 minutes to go to the toilet and/or have a cup of tea before putting their gear back on again to get back to the chain. Often they fill their teacup with cold water so they can drink it in a limited time. new workers to AFFCO are often "called to the office" for a "vigorous discussion" if they join the union. This intimidation is fairly standard. The union is constantly challenging the company for it in court, the company is fined (wet bus ticket slapped on the wrist) and they continue flouting the law that allows people to choose to join an applicable union. Talley's companies, including AFFCO, have an extremely poor health and safety record. ACC has paid out multiple millions of dollars each year for accidents in Talley owned work sites. Campbell Live and 3 News did a number of stories on the accident rates in Talley's owned meatworks. 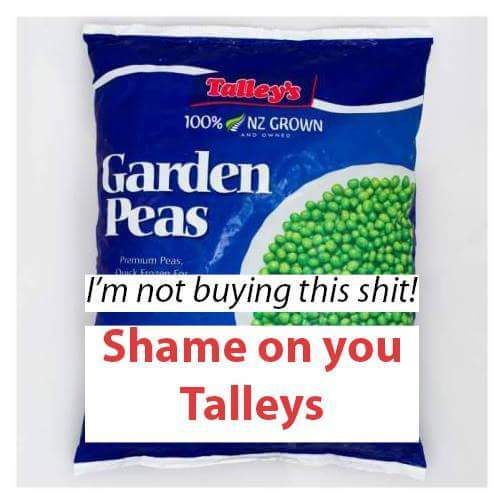 Talleys have been a loud proponent against the proposed health and safety legislation that has been worked on since the Pike River Mine disaster, and has been effective in its efforts to have the legislation watered down significantly. Talleys has form with the meat workers. They have previously refused to negotiate in a constructive manner. 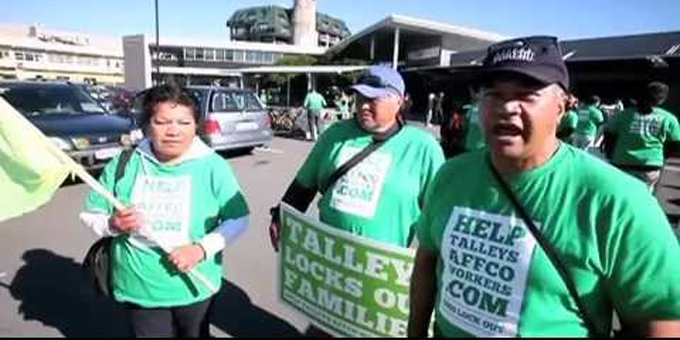 If you remember in 2012, during the previous contract negotiations with Talleys, AFFCO workers were locked out of their work sites for 84 days. . The strike in August 2015 only happened because Talleys would not actually negotiate in good faith. 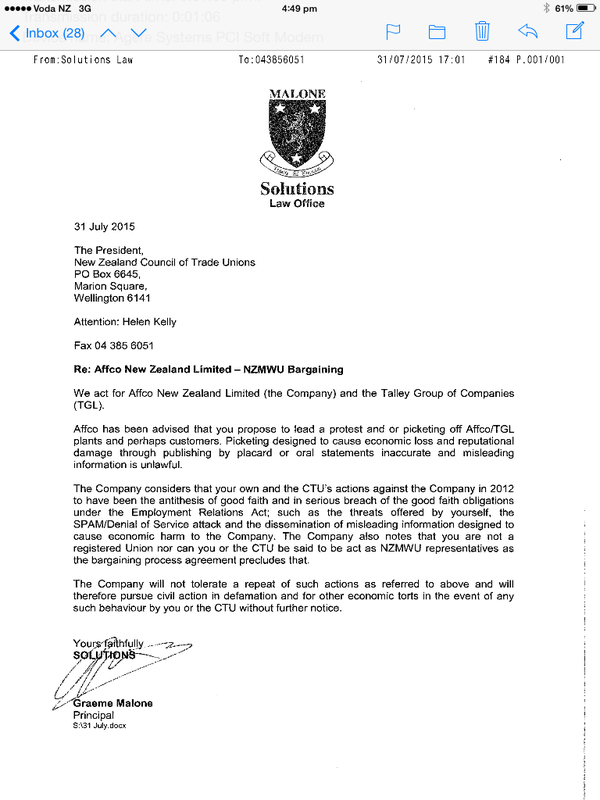 And to add salt to the wound, Talley's lawyers then sent a letter to Helen Kelly, the then President of the CTU, claiming that any CTU actions during this time were unlawful - effectively trying to prevent picketing and the like by others supporting the MWU. Helen Kelly's response was this post on Twitter on the 3rd of August: "Oh I am so scared. I won't be buying Talley's products until they settle a collective agreement with Affco workers." Calls went out to boycott any and all Talley's products - vegetables, seafood.... but the meat workers asked that we still buy products produced by AFFCO. 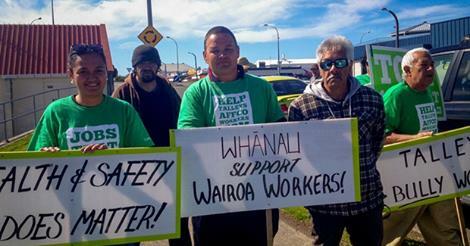 Not long after this, in September, the Wairoa Affco meat workers were locked out of their plant. At the time of writing this they are still locked out - well over 120 days and counting. This is despite a court ruling in November that deemed the lock out illegal and then ordered Talleys and the MWU back to mediation. The Employment Court issued a statement saying the AFFCO plant unlawfully breached the Employment Act by locking out 170 staff who refused to sign new individual contracts. The Meat Workers Union, which has been negotiating for the workers, labelled the decision a "victory". National Secretary Graham Cook said Talley's tried almost everything to prevent workers from bargaining for a fair deal. "They've forced some workers onto individual agreements, they've tried to undermine the union behind closed doors." 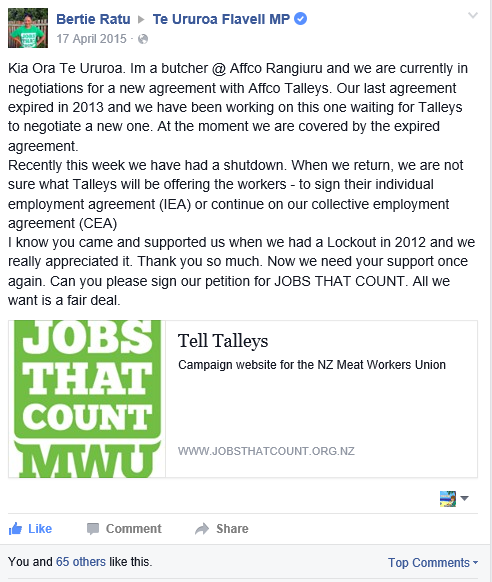 (See Wairoa meat workers lock out deemed illegal from Stuff 17/11/15). AFFCO has said these workers can come back to work - on the night shift only. Keep in mind that some of these people are solo parents or both parents will be expected to work the night shift. So this begs the question of who will look after their kids while they are doing the night shift. A stand off is still in place, and court action is pending. Right before Christmas, AFFCO saw fit to dismiss Bertie Ratu and her union delegate colleague Sharmaine Takai from their positions after they visited workers at the Rangiuru meat works support workers. Bertie was already on suspension for her Facebook post appealing to Maori Party leader and government Minister Te Ururoa Flavell for support for the meat workers to get negotiations going with AFFCO early in 2015. “The delegates were dismissed because they went to work to calm union members upset about unfair treatment and tempers were getting short,” says Darien Fenton of the NZ Meat Workers Union. “I was informed by the company that my visit to the Rangiuru branch breached Health and Safety policies,” says Ratu, from Te Aupouri. “Sacking workers for spurious reasons three days before Xmas highlights the difference between one of New Zealand’s wealthiest families and their workforce,” says Darien Fenton. I had the opportunity to met and hear Bertie Ratu speak at the CTU Women's Conference in July. This is a woman who would like to be doing her job and bringing an income in for her family, which includes her elderly mother. But due to circumstances brought about by unfair employment laws and an anti union employer, Bertie and her colleagues are having to defend their rights to belong to a union publicly and to the detriment of their own families. They are having to fight for the right to have a Collective Employment Agreement that is fair. This is the action of a company that is anti union and anti worker. They are allowed to do this because the government has changed the employment laws so that they favour the bosses and put the worker at a disadvantage. There is no need for bargaining in good faith anymore - these words were removed from the law. Bosses can bulldoze and use the law to grind down the workers rather than negotiate. Once again AFFCO and Talleys, you fail the standard in being good employers. You fail the standard in having respect for your employees. 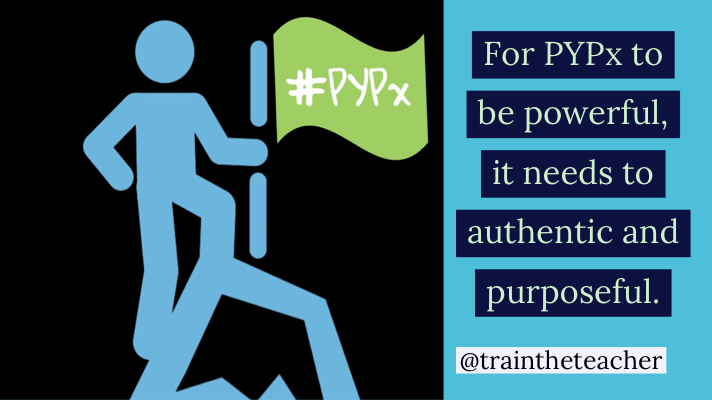 You fail the standard in garnering loyalty from your employees. And a business is really only as good as the people who do the job.